USB flash drives are great for storing personal files on, so you can have easy access to them wherever you go. But what happens if you lose a drive or it gets stolen? All of your personal data could be at risk. While there are ways to secure the contents of a flash drive using software, you need to remember to do so every time. 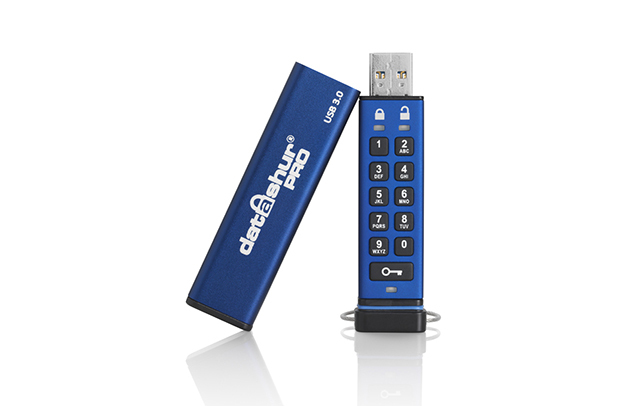 The datAshur PRO, from iStorage, offers a hardware solution that’s simple to use and will protect your data with military grade XTS-AES 256-bit encryption. The USB 3.0 drive is 78mm x 18mm x 8mm in size (H,W,D). It’s longer than many similar devices, but that’s because it comes with an alphanumeric keypad built in. To use it, you just have to press the key button, enter the PIN, press the key button again, and plug it into a USB port. Your PIN can be between 7 and 15 digits long. It comes with a default PIN (11223344) so you’ll obviously want to change this before using. The process for setting your own PIN is straightforward enough. Once you’ve unlocked the drive, press the key button twice, enter the new PIN, and press the key button twice more. Re-enter the new PIN, and press the key button twice a final time, and plug the drive into a USB port. Impressions of the drive were favorable from the start as the device’s aluminum sleeve came with my name laser etched on it, inside the sealed plastic packaging. This is part of the customization options the company offers. In addition, you could have the drives completely branded with a company name, and/or with custom PINs pre-programmed in. datAshur PRO is epoxy coated, to protect it against any physical attacks, and dust and water resistant (IP57 certified). The keyboard is wear resistant, so if you’ve chosen to lock the drive using a memorable word (rather than just a number sequence) you shouldn’t have to worry about the letters rubbing off and leaving you clueless. A twisted wire loop on the end of the drive will let you attach it to a keyring or bag. There are read-only and bootable modes available, it supports both user and admin PINs, and there’s a brute force self-destruct feature that kicks in after ten unsuccessful attempts to guess the PIN. Because it’s hardware only encryption, the drive comes with no software on it at all, so you get the full amount of storage for your own files. It also means it’s OS and platform independent, so you can use it on pretty-much any device with a USB port. You don’t have to remember to lock the drive once you’ve finished using it -- unplugging it does the job for you. If you unlock the drive, and don’t plug it into a port, it will lock automatically after a brief while. This isn’t the only such drive, but having used the datAshur PRO for the past few weeks I can definitely recommend it. If you have personal or company files you don’t want to risk falling into the wrong hands, then it’s the perfect secure solution. datAshur PRO is available in 8GB, 16GB, 32GB and 64GB capacities, priced from £69 ($86). You can buy it direct from here.